A happy gardener is one who admits that she (or he) is never finished in the garden. We talk about being finished all the time, but we know, deep down inside, that there is no “finish” in a garden, no real end to what needs to be done. 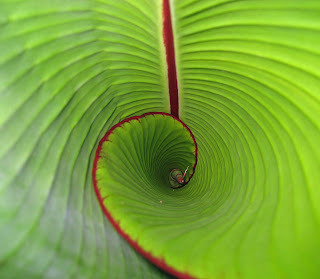 Just like it appears like there is no end, no bottom, to this swirl of leaves of one of my Red Banana plants, Ensete maurelii. We must embrace “never finished” for a happier life. We say, “I’m finished weeding”, and indeed we might look back down a row in the vegetable garden or across a flower bed and see nary a weed left standing, we were so thorough in our weeding. But then the next morning, we slip out to the garden in the first light of day, still in our night clothes, wearing little bunny slippers, tea cup in hand, and run smack dab into a giant weed in that very bed! How did we miss such a big weed? Did it grow overnight? It must have. And all around we see more little weed sprouts. Weeding, we all know, is an ongoing activity. We are never finished with weeding. But the laws of nature decree that no matter how much mulch we buy, we’ll always end up one wheelbarrow load short of what we need, and there will be that one out of the way corner, or furthest section of the garden, that didn’t quite get enough mulch. So we aren’t finished mulching, really, we’ve just run out of mulch. So we add to our “to do” list to get that last bag or two or ten of mulch that we need to finish mulching and then weeks later wonder when we’ll get that done. In the spring, we stand proudly in our vegetable gardens, leaning on our hoes, and announce to anyone nearby “I’ve finished planting the vegetable garden!” And for a little while, maybe even a few days or a week, we really believe we have finished that rite of spring, the planting of the vegetable garden. But then we go out to the garden after work one day and stare in horror at all the pepper plants that have been bitten off by something, someone, in our absence. With total disgust because that someone didn’t even eat the plant after he bit it off, we go to the garden center and buy more pepper plants and plant again. Or maybe the corn came up very sparsely, so we decide the seed was bad and we go buy more seed and plant more corn. And so it continues in the garden, both vegetable and flower. We see a blank spot of earth and think we must fill it with more plants. We are never finished planting. If we really want to be finished with something, we should have chosen other hobbies. We could have chosen to make miniature dollhouses. Once you’ve finished one, it’s done. There is no more to do. You can put it on a shelf or give it to someone and start over with a new dollhouse. Or we could have chosen to sew quilts. You can finish making a quilt. When it's finished, you can wrap yourself up in it, lay it across the foot of the bed, or give it away and start a new one. But we chose gardening, or gardening chose us. With gardening, “finished” never means “done”. It means we got as far as we could before we wore ourselves out or we ran out of dirt or plants or seed. Or maybe it got too hot or rained a bunch so we had to stop for a bit. But it never means “the end”, “finished”, “no more”. We are gardeners. We should embrace “never finished” for a happier life. My favorite 'Embrace' post yet! We do need to embrace it or at least admit to the truth and life will be much less frustrating! Actually, we who garden where the snow flies do have a finish - we're done with leaf collection when the snow covers the ground, whether all the leaves are picked up or not. You're right about never being finished with anything during the growing season. I'd get bored if there was nothing that needed doing. Excellent! I agree with Leslie, the best so far in your Embrace series. I wonder if I can staple it to my forehead? I need to be reminded of these truths about that often. I agree with MMD. I love all the tasks that come with gardening. Ok except lugging hoses to water. If there wasn't anything to do because "the garden was finished" it would be boring. Great post Carol. Carol -- Oh how true. And the depressing part is that I'm a lscrapbooker, too, which is also a never "finished" hobby. Am I nuts, or what??!!! And I am soooooo inherently a "finisher!" Ah well, guess it's just Mother Nature toying with me. Good thing I have a sense of humor! It can feel overwhelming sometimes, but yes - gardening is never done. Once we get our deck done - I know I want to put in hammocks. Now that I have one garden bed - I want two more. Now that we expanded one of our flower beds a foot - now it needs widened 2 feet. Never ends! Which is nice but sometimes it just makes you feel exhausted. I can't tell you how many times we stood there in our first garden and declared it "done." As you said... happily it is never "done." Awesome photo, Carol. That's print and frame worthy! And would we really BE happy if it could ever all be finished? The process is 90% of the joy. :) Awesome photo! It is all about the process. I don't want it to end. Embrace the activity. Indeed - it's the process that keeps me happy. If I will ever feel that I'm finished with my garden - I will either have lost interest in gardening or I will buy me a new house and start all over again. And that's why we love gardening, it's ongoing and ever changing. It's the magic of nature to continue spiraling day after day, season after season. Great post, and lovely pic of the banana plant. I will admit to being never finished. At this moment I have about 15 plants still in pots waiting for movement to their fine new home, including 12 pricey Kingston Cardinal hellebores. I'm not sure I'm ready to "embrace" the idea of never finished, but I will acknowledge that I never will be! Carol, so true! What a great post - it got me to thinking. You know what? I think one of the reasons I like gardening is that it's NOT finished. Along with work to be done, there is always the chance of a surprise and the opportunity of a do over. And when you need the garden, it's there waiting for you. For Diane: I'm a scrapbooker, too. There is no place called Caught Up, and I'm so glad I discovered that. Stacy Julian's Big Picture and Photo Freedom books explain, and the class Library of Memories (taught once each year) set me free. Now, it's about the process and enjoying what I've done. I have some of my stuff on my craft blog http://toomuchstuff.typepad.com if you'd like to stop by. Good luck to you! When we lived in Maine we had friends who lived at NeverDun Farm. Sometimes we think not only are we Neverdun, we often feel Barely Begun. But isn't that life? If we are healthy and lucky? I guess gardening is like housework that way, but oh so much more satisfying. You are so right about it never being done. But even if it could be, I don't think any true gardener would be happy. We'd start looking for excuses to tear everything out and begin again, just for the love of digging. I have a banana like yours. It didn't look that great when we bought it and still doesnt. The guy that cut my lawn said he put his in the edge of the lake behind his house and it now has bananas. Must need more water. Thanks, Carol; I needed this! I'm a person who likes to complete a project, but gardening certainly doesn't work that way, does it? My motto is always, "well next year I'll do a better job of weeding/planning/mulching..." I guess if there wasn't always room for improvement, gardening wouldn't be so interesting. The lovely green of the photo reminds me of a labyrinth. Yes, you are right, gardening simply is not done or completed. There is always weeding, planting, feeding, pruning, etc. And I live in a temperate climate so gardening goes all year with a rest in Dec. & Jan. I embrace all your comments! Thanks for embracing "never finished"... speaking of which, I sure do have a lot of "never finished" to attend to in the garden today! Hehe, each time I sit down to relax among the flowers I think of or see something that needs doing! I love it though, the fact that there's no finish is one of my favorite parts of being a gardener!